Our members over the years have made their name in most colleges of Delhi University and outside DU as well, ranging from IIT Kanpur to the Delhi Poetry Festival. For three years, we have been successful in putting up an annual society fest, Rhetorica, where we invite speakers to expound on topics of interest and have creative writing competitions and booths for writing-related entertainment, all organized and managed by our members. 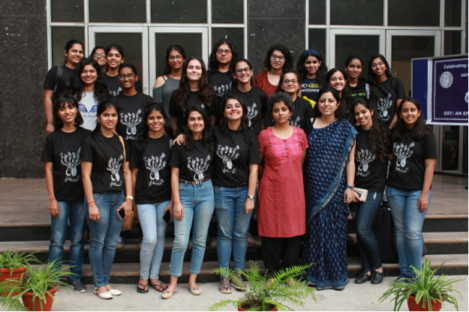 Most recently, we had Kamla Bhasin, the renowned feminist and writer, as our speaker, and introduced participants to blackout poetry. Tavleen Singh: 1st in Tabula Rasa (the creative writing competition of Hansraj College); 3rd in Words Words Everywhere (LSR), and IIT Kanpur's creative writing competition. Aqsa Ashraf: 3rd in CVS creative writing competition; 1st in IIT Kanpur's creative writing competition. Apart from these, Kirti Wadhwa got her poem published in Kaafiya magazine and received a special mention at the Delhi Poetry Festival.